duo who perform Pop, Rock, & New Country. Since that fateful meeting they have performed in Las Vegas Has Talent, and on The Morning Blend. They were the opening night band for the first performance of the hugely successful show, Raiding the Rock Vault, and have performed several times at the Rush Lounge at the Golden Nugget, charitable concerts, benefits, and more....with many more coming up, including tentative tour dates for appearances in China later this year. 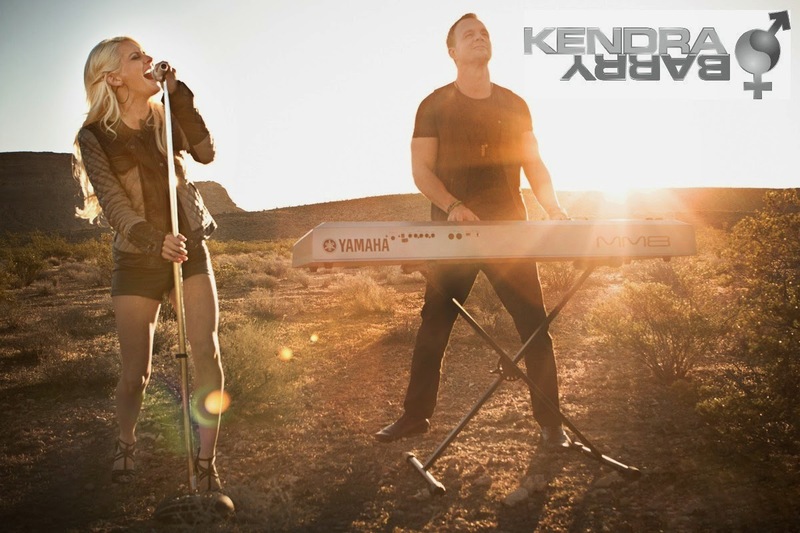 Shortly after pairing up musically Kendra and Barry wrote their first song, Make Me Fall, which debuted at #6 on ReverbNation.com charts when first released earlier this spring! Make Me Fall is the kind of song you like right away when you first hear it. I personally think it would be great in a film. So, who are Kendra and Barry?....Let's find out! Kendra: Growing up my musical inspirations were my parents singing in their legendary band "Hush" of North Shore Boston, Massachusetts. "Hush" was very prominent for the time and they led me in the footsteps of where I am today. Now I strongly look up to New Country Pop artists like Carrie Underwood and Pop Artist Christina Aguilera whose vocals brings me to the top of my range. Her vocal riffs are legendary even today and keeps me working to perfect my craft. I am constantly growing as a musician. Barry: For me, I listened to 80's rock and Classic Rock, bands like Van Halen, Journey and Boston. I feel my sound is different in that I have a guitaristic approach to my keyboard style. I used to sit in my room and listen to Van Halen solos and learn them note for note on my board. I always wanted to bring a more masculine feel to the keys, it felt more natural since that was what I loved hearing and where my heart was. I loved Journey because sometimes I just wanted to slow down and play a ballad that will touch your heart, Jonathan Cain was great at hitting those sweet notes on piano with a little bit of a Rock and Roll edge. I was very shy and besides loving the music at that age I liked the idea of having groupies! Later on in the 90's I heard Dream Theater's Derek Sherinian, I was excited to hear someone shred on the keys like Derek does because that was the edge I always pushed for, especially when I soloed. Over the years I have incorporated some pop influences to stay current and recently Kendra introduced me to New Country which has a Rock edge. I love that Honky Tonk bluesy piano style, it's fun to play. I play guitar on some of our tracks, those styles come through on my guitar playing as well. Now I pretty much listen to everything that is current, every time I add something new it gives our music a little different flavor. I will say that we will always sound like Kendra Barry, we just use different spices when we cook our soup....you'll always taste that basic flavor. HA! Kendra Barry Performing before the Raiding the Rock Vault and meeting those guys, what a treat that was! As far as we know we are the ONLY band to ever perform before the Raiding the Rock Vault show and one of the few bands in history to ever perform on that stage.....the very stage Elvis used to perform on at LVH. Kendra: Another highlight for me has been performing in many charity local events all over Massachusetts including winning the "Talent of Miss Massachusetts" for multiple consecutive years. This opened doors to opportunities where I worked with the best of the best in Nashville. Also getting the chance to work with one of Christina Aguilera's producers in Los Angeles was amazing and so is my work with Kendra Barry! Barry: I played keys for Carnival Cruise Lines for a few shows, went to college for Piano Performance, minored in guitar. I had an amazing opportunity in my teens years to play with a high school show choir which ended up turning into a rock band with 8 singers. We played all the current rock/pop songs of the day, did small tours and benefit concerts. I believe after those 3 years I had close to 300 shows under my belt by the time I was 18, not including my work with other bands. We even won a talent show against 7 other states for best instrumentalist. We played "Frankenstein" by the Edgar Winter band, here we were these young teenagers walking out on stage rocking out and shredding rock solos on our instruments in front of a few thousand people, they didn't know what hit 'em! Of course we'd had the opportunity to be in Rock Band Class every single day in school during our high school years. We logged a lot of hours of practice and rehearsal, I am so grateful for that! Kendra: Besides signing, I am also involved in modeling, acting, dancing, and horseback riding. I'm also a Black Belt in Tang Soo Do. Barry: In addition to music I love acting, collecting foreign currency (only paper, no coins), fitness, reading and business/online retail. Kendra Barry: If we could play anywhere in the world it would be Madison Square Garden! Kendra Barry: Most of all we both have fun when we perform, and have great musical chemistry. When we go up on stage something happens, we light up and our souls come out in our music. We've been told we are fun to watch, and believe its because we love what we do and want to share this with our audiences. In every hit song there is a "moment," during rehearsals and we are finding those moments in our songs. We rearrange them so they also become moments for our listeners too. Connecting with our audience creates a positive experience we all take home with us after the show! Like many bands and musicians before them who originated in Las Vegas, (Panic! At the Disco, Slaughter, Ne-Yo, The Killers and Imagine Dragons to name a few), Kendra Barry has the talent, style and passion to go far, while connecting artistically with audiences all along the way. Where can you see Kendra Barry perform? "Noises Off" is spot on at Las Vegas Academy Theatre! The other night I LMAO'd at the Las Vegas Academy Theatre's production of Noises Off...which runs through Saturday, May 3, (7pm). Noises Off is a 1982 play by Michael Frayn. When Frayn was watching from the wings of a performance years ago of his play, The Two of Us he realized it was funnier from behind than in front, and decided to write a play from that perspective. First came the short-lived one-act play called Exits, which was written and performed in 1977. Frayn then expanded it into what would become Noises Off after the suggestion was made by his associate Michael Codron.... Noises Off takes its title from the theatrical stage direction indicating sounds coming from offstage. This is one of the few well known plays I have never seen before, so I watched the performance with no previous examples of which to compare. In the show, all three acts you are watching are actually Act One of the play within the play, which is called Nothing's On. Very quickly into the first act this is established when the "director" shouts to one of the actresses on stage from a second row seat. Sam Goldstein as Director, Lloyd Dallas was commanding but also communicating an exasperated impatience with his cast and their habit of fielding their last minute blocking and character suggestions. Casey Andrews as Garry/Roger seems to be so much into character that he actually blushes for real several times throughout the play! It is also obvious to the audience that he would have no idea what to do with a woman like Brooke/Vicki should he ever actually get her alone. Ireland Ciechalski is delightfully funny as Brooke Ashton/Vicki, Ireland had the complex task of being beautiful and funny, and pulled it off with aplomb! Keaton Johns as Selsdom Mowbray/Burglar has the "I have no idea I am so clueless" character, to a "T". He's so likeable everyone just wants to help him not belittle him and we have all known people like that. Tessa Lepore as Poppy the stagehand exudes an inner frustration that she is not one of the cast but relegated to stage hand, which is truly fine acting because Tessa is a character in the cast of the play, but her character isn't. Abby Dandy as Dotty/Mrs. Clackett carries off the tired but capable characters she inhabits. Especially evident in Act Two she manages to keep her physical character moving at the pace a middle aged frump would while trying to keep up in a situation where speed is needed for so much action. Taylor Paulson as Belinda/Flavia and Julian Dietrich as Frederick/Philip remained the comedic offset as "straight men" to everyone around them, at least in Nothing's On...even as Frederick (as Philip) is temporarily replaced for about a minute in Act Three by Tim Allgood (Hunter Schwartz). Hunter is hilarious as set up for Act Three as he attempts to introduce the play and explain the late beginning without "losing it".....the audience can relate to it because we have all been in his shoes in one way or another. There is a fine line between scary mad and funny and Hunter walks it well. Farce is fun. Farce is silly. Farce is outrageous. Don't try to make sens of it just go with it! In Act Three, which is again Act One of the play within the play, it is now ten weeks later later and the cast is showing signs of coming apart at the seams in a play filled with props, prat falls, doors, windows, and sardines! The exasperation of the actors which they are trying to hide while playing their characters is carried off with the dimension and humor I believe the writer intended. While watching clips of this play on YouTube while preparing to see and write about the it I saw many versions. Most of them worked very well. However when they didn't, it was because the timing was too slow and/or the actors couldn't pull off the characters within the characters and in that missed the opportunities for the comedic moments. However, the Las Vegas Academy Theatre cast and crew did all of this and more, with FLAIR! Did you know?...Noises Off premiered at the Lync Theatre, Hammersmith, London in 1982. The Broadway debut, which started in 1983 ran for 553 performances. What is unusual about this play is that Michael Frayn has continually rewritten and updated it, the most recent in 2000. There are numerous differences between the 1982 and 2000 scripts. There was a film version on Noises Off in 1992 directed by Peter Bogdanovich starring Carol Burnett, Michale Caine, Christopher Reeve, John Ritter, Marilu Henner and Nicollette Sheridan. Tessa Lepore (Poppy) & Anna Wendt, Blogger, April 26th, 2014. Cast and Crew of "Noises Off"
For me, once was not enough. Just over a year ago I checked out this show in its first previews, then spread the word through my blog. 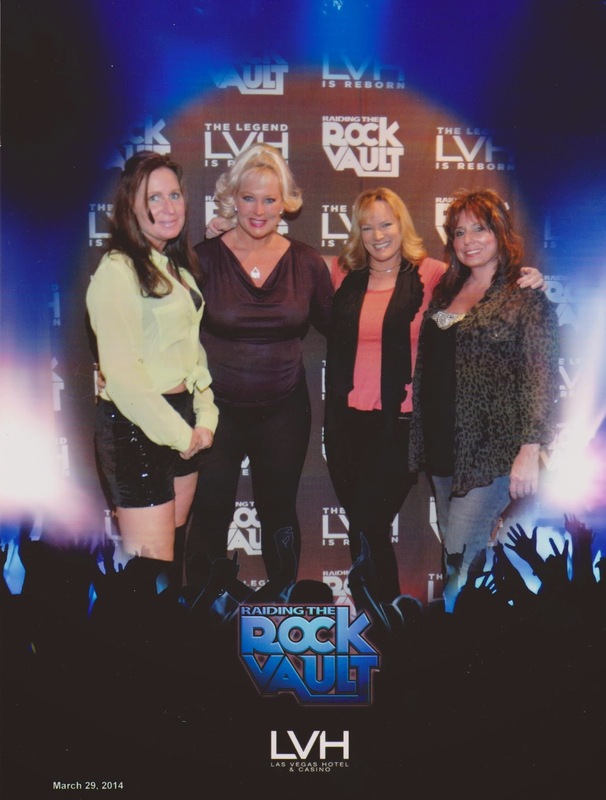 This spring when I had some friends in town we decided to make it a rockin' ladies night out and so I headed for the Las Vegas Hotel and Raiding the Rock Vault, again. Girls night out doesn't get any better than this! First of all you've got to know it is nearly impossible to see this show without ending up dancing or standing and singing at the top of your lungs. Trust me, the band wants you to do that. This is not the show to sit quietly and be polite! Seeing it this time I was surprised they have added female vocalists who perform on certain nights. The night we went Carol-Lyn Liddle took the stage and blew everyone away with her voice and style as we all sang, (shouted) along! Funny how most of us in the audience could remember the words to these songs, some we hadn't heard in years. I guess classic rock just has a way of sticking in one's head.....maybe it's the lyrics about love, youth, rebellion and individuality that stay with us forever....like a burning ember just waiting to be stoked. 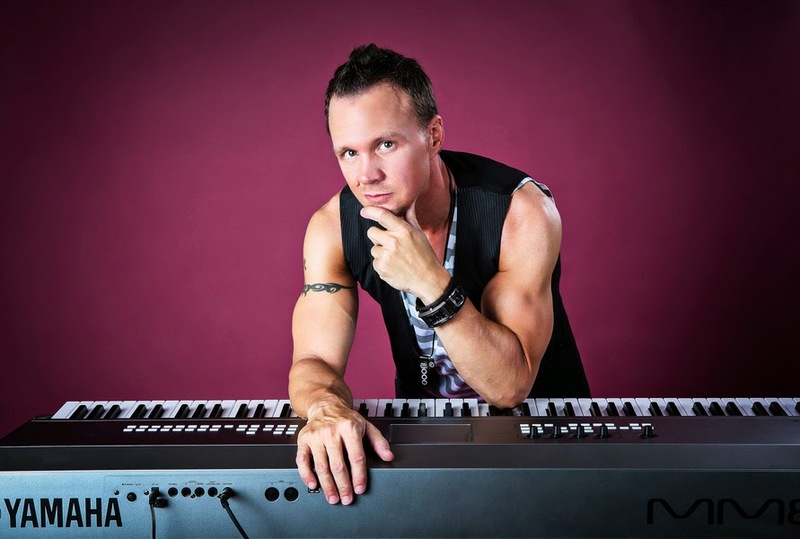 The show originated from an idea to play classic rock cover songs from Rock n' Roll musicians and singers who had performed worldwide in well known bands, such as Heart, White Snake, Lynch Mob, Bad Company, Asia, and more. The creators took the concept of a tribute to classic rock from 1960's -1980's and created a rock musical out of it. The show is set in the future where explorers find a time capsule, (the rock vault) containing these classic songs and in doing so discover the effects history and society had on music during those years, or the other way around. Since Rock N' Roll was still pretty new, I think it was a mutual influence, as do most. From these guys you're going to hear The Who, Led Zeppelin, The Rolling Stones, Jimi Hendrix, Free, AC/DC, Journey, Pat Benatar, Aerosmith, and a lot more. When I saw the show last year one of the first things I did was go on TripAdvisor to give them a great review and add their event as an official attraction, (since the first two reviewers before me hadn't). I didn't realize this until John Payne announced it after the show but Raiding the Rock Vault is rated #3 out of #559 attractions in Las Vegas on TripAdvisor....Also, the show was just voted Best Musical in the Las Vegas Review Journal's annual Best of Las Vegas Issue earlier this spring. This is all after only 14 months in Las Vegas. A pretty remarkable beginning for a show debuting here, a town overflowing with live entertainment. The creators, performers, and everyone involved with Raiding the Rock Vault found a missing niche....and rocked it! The Rock Vault....Who are they? Who are the actors in the Raiding The Rock Vault flashback sequences?...Richard Malmos, Ryan Mueller, Coby Mosby, Amanda Gibson and Sarah Jessica Rhodes!